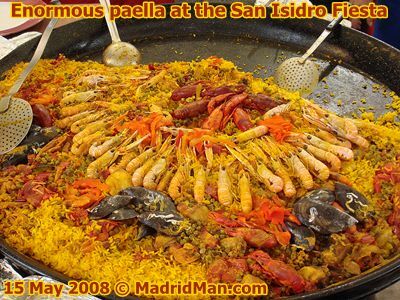 What a perfect day it was for today’s Madrid’s Patron Saint, San Isidro el Labrador. The weather could not have been more perfect. Many people seemed to stay away in the morning because of the cool temperatures and mostly cloudy skies, no doubt fearing rain – but it never happened. 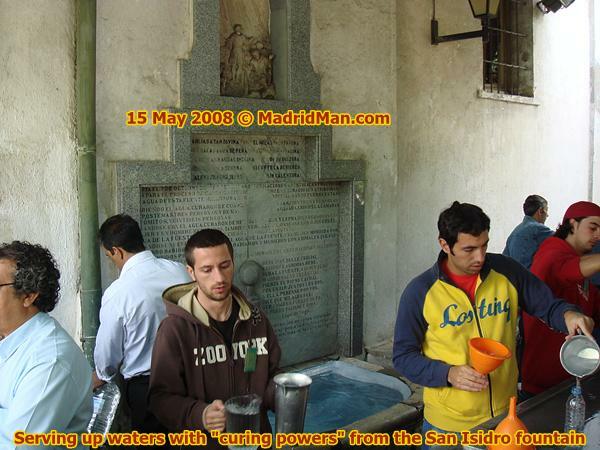 I was watching the festivities on TeleMadrid this morning and they noted the low turn-out so I took my opportunity to go early, arriving at the line at about 11:45am to drink water “with curing powers” at the fountain alongside the Ermita del Santo – La Ermita de San Isidro. The line went fast, about 25 minutes (which is REALLY fast, usually taking an hour), and I happily took a glass (yes, a glass made of glass) filled with water from the fountain behind the stand. I had to wonder how many people had drunk from the same glass from which I was now drinking. Hmmm… But fine. I was there, I had no refillable bottle as others had brought, so I took my chances and hoped the water’s “healing powers” would cure me of any bacteria which might pass over my lips from the person(s) before me whom had drunk from the same glass. Going by myself I really enjoyed myself a lot, I could take my time, being alone I didn’t have any problems “slicing” through the crowds. As you know when there are two or three of you it’s much more stressful, all the while avoiding oncoming persons whom aren’t watching where they’re going. But in being alone I could enjoy all the cute kids in their chulapo and chulapa costumes, so very very cute. 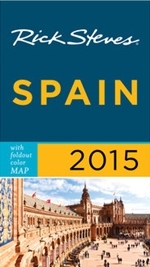 I made one long walk up the main street and salivated over all the wonderfully delicious looking foods, chopitos, fried sardines, patatas bravas, croquetas, pulpo a la Gallega, enormous paellas, roasted chickens, and bar after bar after bar. Man, if it wasn’t so early (1pm by this time) and if I didn’t already have lunch plans I would have happily sat down for a feast. But before leaving, I stopped at one of the dozens of stands selling PILES upon PILES of “Rosquillas” which are deep fried doughnut-like rings and topped with different sweet frostings. I bought 4 dozen total of different varieties and shared them later with friends – but brought half of them home for “meriendas” with coffee. After a home-cooked meal at some friends’ house and after a good sitting-up nap on the sofa afterwards, we all made it back to the Berbena de San Isidro, luckily just a short walk away as all this is close to where I live. 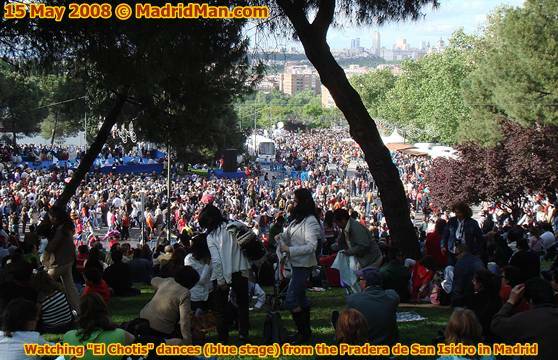 We sat on the grassy hill in the Pradera de San Isidro and watched staged Chotis dances to music. We walked through the now hordes of people (and I mean hordes!) of people. Or rather, we stood and waited for the mass to move so that we could move with it. Finally we did and took a back-track with fewer people, away from the stands and the performances and walked more easily through the Pradera de San Isidro park and I arrived home by sunset. I had half thought to go back tonight and see how the promenade looks with all the festival lights, imagining there would probably be far fewer people and to have a snack but I’m SO NOT HUNGRY that I can’t imagine returning. It’s tempting though. The berbena will be going on most of the night with lots of concerts – which I’ll surely hear as I’m lying in bed. But I think I’ve taken quite a nice taste of the Fiesta de San Isidro this year. GREAT weather, fewer people (at least in the morning), and a good experience through and through. Can’t wait ’til next year. 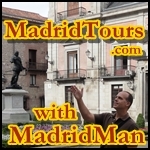 This entry was posted in About Spain, Entertainment, Food, Photos and tagged berbena, Chulapas, Chulapos, El Chotis, Ermita del Santo, Fuente del Santo, Pradera, pradera de san isidro, san isidro. Bookmark the permalink.